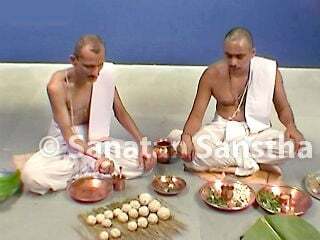 Narayan Nagbali and Tripindi shradh rites are performed with the objective of providing momentum to the pitars (Ancestors). Scriptures say that one should spend 1/10th of the annual income for the purpose. However, it does not matter if one spends as per his capacity. 1. Who can perform Narayan nagbali and Tripindi shradh rites ? A. These are rites are performed with expectations of some gains and can be performed by anyone, even by those whose parents are alive. B. 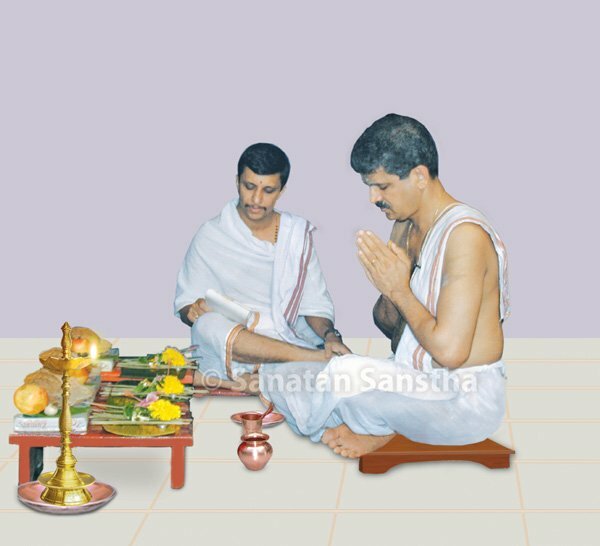 Even the unmarried can perform these rites individually. However, if married, they should be performed jointly by the husband and wife. B. A woman with a pregnancy beyond five months should not perform these rites. C. If there is an auspicious ceremony in the family such as a wedding, a thread ceremony, etc. or if some family member has expired, the rite should not be performed for a year. 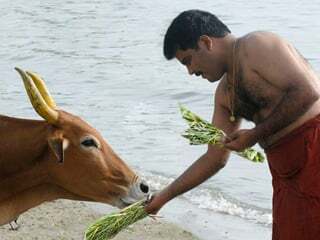 A man performing these rites should wear a new dhoti, uparna (A shawl or a small single cloth worn loosely over the shoulders) and a vest, while a woman should wear a saree, blouse and petticoat (black or green colours are prohibited). After using these new clothes in the rites, the clothes should be donated. On the third day of the rites, a gold serpent (weighing 1.25 grams) is worshipped ritualistically and then donated. All the three rites are different. Narayan-Nagbali is a rite that lasts for three days, while Tripindi shradh lasts for one day. If all the three rites are to be performed, three days are required. An independent one day rite can also be performed. If the post-death rites of those who have had an unnatural death or have committed suicide have not been done, and as a result, they continue to remain in the corpse state, then the subtle-body does not gain momentum and consequently it keeps wandering. Such a subtle-body prevents procreation in its descendants and also torments them in some way or the other. To provide momentum to such a subtle-body, the rite of Narayanbali should be performed. To perform the rite of Narayanbali, Shukla (Bright fortnight) Ekadashi and Dwadashi of any Hindu lunar month are ideal. The Deities should be instated on the day of Ekadashi and the shradh performed on Dwadashi. (Nowadays, most people perform both on the same day.) If this rite is being performed for progeny, the concerned couple has to perform it. The rite should be performed on the banks of a river or any other sacred place. After a ritualistic bath at the place of pilgrimage, make a resolve to perform Narayanbali. Gold Idols of Shrivishnu and Vaivasvat Yama should be instated on two pots and their Shodashopachar (Ritualistic worship involving sixteen specific substances or steps) worship should be performed. Draw a line with a blade of darbha to the east of the pots and spread the darbhas southwards. Sprinkle water on them amidst recitation of the mantra – ‘शुन्धन्तां विष्णुरूपी प्रेतः’ ten times. Offer ten pindas which additionally have honey, ghee and sesame seeds on the darbhas amidst recitation of ‘काश्यपगोत्र अमुकप्रेत विष्णुदैवत अयं ते पिण्डः’ Worship the pindas with application of sandalwood paste and then immerse them in a river or a water-body. This is the rite of the first day. 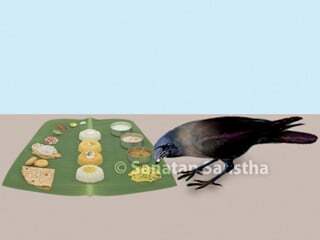 Perform the ritualistic worship of Shrivishnnu during the mid-day. Then, invite Brahmans in odd numbers, that is, one, three or five, and perform Ekoddishta shradh of the corpse in the form of Shrivishnnu. From washing the feet of the Brahmans till satisfying them with a meal, perform this shradh without recitation of mantras. Offer four pindas to Shrivishnu, Brahma, Shiva and Yama together with His retinue, amidst chanting of their Names. Offer the fifth pinda to the corpse in the form of Shrivishnu. After ritualistic worship, immerse the pindas and offer dakshina to the Brahmans. One Brahman should be offered clothes, ornaments, a cow and gold, and a prayer should be made to the Brahmans to offer tilanjali to the corpse. The Brahmans should then take water that contains darbha, sesame seeds and tulsi leaves into the palms, and offer it to the corpse. It is said that this rite bestows a corpse a place in heaven. The Smrutis state that the rites of Narayanabali and Nagbali are performed with the same objective; hence, the tradition is to perform them together. That is why the combined name of Narayana-Nagbali has become common. If a pitar in the family had killed a cobra, and since that cobra did not gain momentum for its journey to the next higher region, it obstructs the birth of heirs to the family. It also torments the descendants of that family in some way or the other. This rite is performed to overcome these problems. The objectives of performing this shradh are to provide momentum for the onward journey to the unidentified from the family or souls that have had a bad life after death and also those tormenting family members. In other words, to assist souls entrapped on the earth, in space or in the Nether region attain Moksha. The other shradhs performed are for a particular individual or are restricted to three generations of pitars, namely, the father, grandfather and the great-grandfather. This shradh, in contrast, appeases the pitars from generations preceding even these. Every family should perform this rite every twelve years. If the horoscope of an individual shows pitrudosha (Defects arising from pitars on father’s side), then to eliminate it the individual should perform this rite even when the parents are alive. To perform Tripindi shradh the ideal days are Ashtami (Eighth day of lunar fortnight), Ekadashi (Eleventh day), Chaturdashi (Fourteenth day), Amavasya (New-moon day), Pournima (Full-moon day) and the entire Pitrupaksha. This rite should not be performed during Guru Shukrasta (When the planets Jupiter and Venus are not visible in the sky), during the Ganesh festival and the Navaratri that falls in the autumn season. Tryambakeshwar, Gokarna, Mahabaleshwar, Garudeshwar, Harihareshwar (South Kashi) and Kashi (Varanasi) are ideal for performing a Tripindi shradh. After bathing at some pilgrimage place, make a resolve for the shradh. Then, as per the rites of the shradh, perform ritualistic worship of Mahavishnu and the Brahman invitees. Thereafter, make three pindas one each of barley, rice and sesame seed flour. Spread darbha on the ground, place pindas on it and offer them by sprinkling tilodak over them. A rectangular piece of unstitched cloth, usually around 4-5 metres long, wrapped around the waist and the legs and knotted at the waist by Hindus.